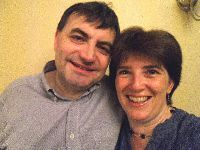 Sue and Chris Monckton-Rickett lead an organisation called WINGS (Wholeness in God’s Son), which seeks to bring wholeness to the lives of individuals, families and communities through counselling, prayer ministry, leading retreats and teaching on pastoral care, healing and counselling. They are both Registered Accredited Counsellor with the Association of Christian Counsellors (ACC). In addition Sue is a Vice chair of ACC. They each have over 25 years counselling experience working with a broad spectrum of clients including people in Christian ministry and their families. Their training has been in counselling and creative therapy (Sandplay Therapy). Their work as trainers includes delivering the ACC Resourcing Pastoral Care Course to enable pastoral carers and the wider church / organisations to increase their understanding and the support they can give to people in sressful or traumatic situations. They also provide training on prayer ministry. They have been leading retreats for carers and others for over 10 years.